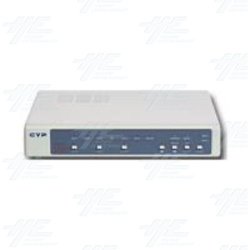 CDM-830T Multi-system Converter provides broadcast quality conversion between numerous worldwide broadcast television standards---N3, N4, PAL, PAL M, PAL N, Secam.- Built-in TBC Genlock capability for synchronizing multiple asynchronous video sources. Two sets of video and S-VHS inputs. One output for each of composite video, S-VHS and Y, B-Y, R-Y. Digital conversion from input TV signals of NTSC 3.58, NTSC 4.43, PAL, PAL M, PAL N, SECAM to output signals of NTSC 3.58, NTSC 4.43, PAL, PAL M, PAL N, SECAM. Digital comb filter for input system decoding. Built-in Time Base Correction (T.B.C) function for signal synchronization. Built-in automatic gain control (A.G.C) function ensures 1 Vp-p output signal (input level can range from 0.5 Vp-p to 2 Vp-p). Full digital decoding and encoding; highly integrated digital processing reduces the board size and ensures reliable quality. A color-bar pattern will automatically appear on the TV screen when there is no video signal present on the input. TBC is active at all time, even in the bypass mode. Built-in TBC.Genlock capability for synchronizing multiple asynchronous video sources. Adjustable control on contrast, brightness, color, Tint and Horizontal/Vertical phase of TBC video.